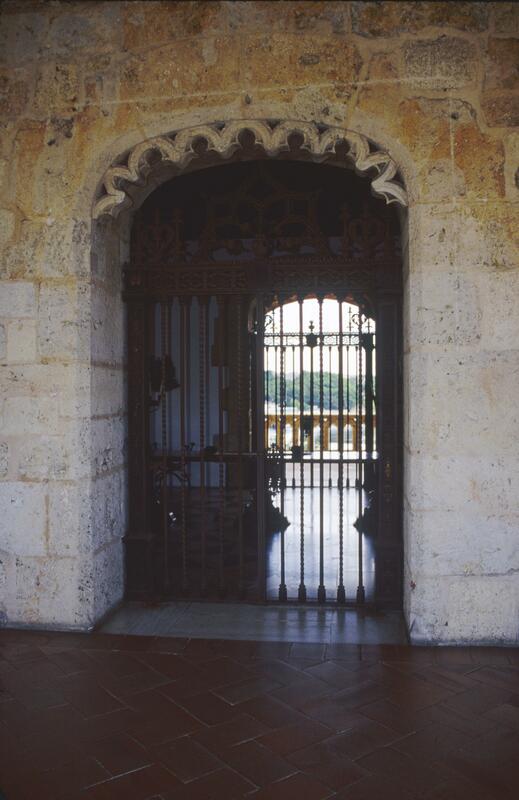 This doorway is on the second floor of the palace built for the son of Christopher Columbus. As in other parts of the building, architectural details, here an ornamental fret, focus on a doorway. It evokes the architectural styles of Spain, which were deeply indebted to Islamic examples. Since the building is quite shallow, paired openings on either side would have allowed cooling air to pass through, as well as commanding views of the city and river. Palm, Erwin Walter. 1945-46. “Plateresque and Renaissance Monuments of the Island of Hispaniola.” The Journal of the Society of Architectural Historians 5, 1-14. Palm, Erwin Walter. 1974. Arquitectura y arte colonial en Santo Domingo. Santo Domingo: Editora de la Universidad Autónoma de Santo Domingo. Palm, Erwin Walter. 1984. Los monumentos arquitectónicos de la Española. 2nd ed. 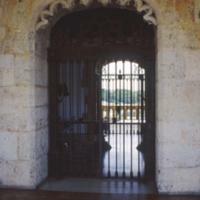 Santo Domingo: Editora de Santo Domingo.